Tools tailored to meet your travel need. Included is a Travel Roll-up Pouch. It has pockets of varying widths to accommodate a wide range of contents with side pockets to hold small or loose items in place. Briseida R. Reviewed by Briseida R.
Nestor M. Reviewed by Nestor M.
Doris E. Reviewed by Doris E.
These little guys blend big! Just tried these today on my Urban Decay brand eyeshadows. 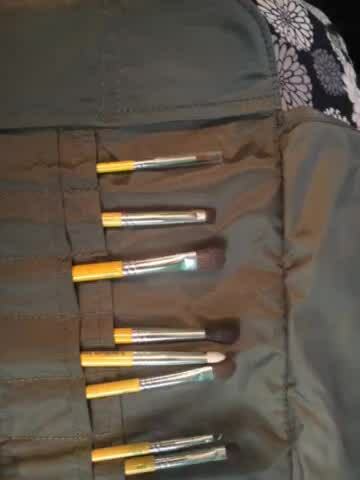 My teacher recommended trying these brushes so I bought this travel size before making a larger investment. I was having problems with blending and after working out the kinks with an instructor she said my current brushes were horrible and that they were making it harder for me to blend correctly and quickly. Well, I have the correct part down now and these brushes help me do it faster!